"" Writer's Wanderings: A Scrapbook of Christmas Firsts--Seen at the Trevi Fountain! 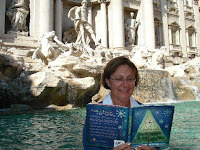 A Scrapbook of Christmas Firsts--Seen at the Trevi Fountain! While scores of people tossed coins over my head, I opened my copy of A Scrapbook of Christmas Firsts again, this time in front of the Trevi Fountain. The fountain is fed by the amazing system of aqueducts built in ancient Rome. Trevi Fountain was completed in 1762 by Nicola Salvi. The main figure is “Ocean” who represents water in all its forms. The water gushes from 24 spouts and disappears underground to rush toward Bernini’s Four Rivers Fountain in Piazza Navona. Legend, or tradition, says that tossing a coin into the fountain will ensure that you will return sometime to Rome. Bob handed me a quarter but since I was the only one tossing it and it was American money, we may not make it all the way back. Still, we can say we followed tradition. I think I like the Christmas traditions in our book a little better.